Andrew smiles as he thinks back to 1976. "After Star Wars my reputation grew. The management at Shepperton Studios asked if I would like to operate from the Old Power House at the studios. I leapt at this chance. I therefore moved to Shepperton Studios to concentrate on film, advertisement and television prop production for about five years (1976-1981). 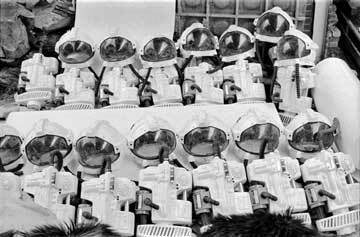 I did work for Gerry Anderson on Space 1999. I designed and built the front projection screen and wind machines for Superman in 1977 and also worked on Alien for Ridley Scott." The Old Power House at Shepperton Film Studios proved an ideal venue for manufacturing and making new contacts. The premises incorporated a display area where art directors could view all previous props and sets that Andrew had made. The display often gave inspiration for future projects and was a clear demonstration of what Andrew could achieve. Andrew continues "I had a great five years in the world of props and then suddenly, as if out of nowhere, somebody invented the computer and conventional prop makers were history. Well, I hate computers so I gave up the film business and proceeded to build another empire related to other products I had designed by this time - water sports." Find out more in Andrews pictorial guide to his film work below: part 1 covers the period to 1978, part 2 covers from 1979 on. Both of these are large files and may take some time to download. Andrew designed and built the thermo plastic front projection screen that the Superman flying sequences were filmed on. This was in conjunction with Wally Vivas, the highly respected camera specialist. The screen was built from interlocking thermoplastic sheets, covered with 3M microballoons for reflection. The sheets were connected to each other using 'fishplate' designed fixings that allowed continual expansion and contraction of the screen without distortion. The studios at that time only had wind machines made from aero engines on a dolly, strapped down to the floor and so noisy that sound couldn't be shot with the film. 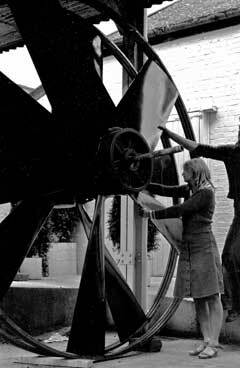 Andrew designed and built quiet wind machines from ABS vacuum formed skins, backfilled with PU foam over internal metal space frames. The machines were run by electric motors, large ones on the ground and small ones in front of Superman's face to blow his cloak during the flying sequences. Andrew was asked to make an alien monster from the concept painting of H R Gieger. 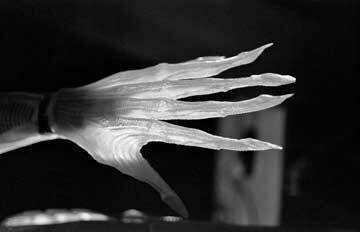 The idea was that the monster's skin and flesh should be translucent, so that all organs withing the body were visible. Andrew built an electric rotisserie oven to cook and form PVC polyols into flesh like structures. Although the translucency was achieved, the 'tear' strength of the material was a challenge. Andrew overcame the technical problems eventually, but time was running on and Ridley Scott, the film's director, had the masterful idea of not showing the actual Alien, which only enhanced the suspense of the film. The film was made at Shepperton, Elstree and Bray studios. 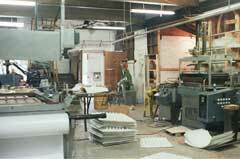 Andrew also supplied vacuum formed space panels to all three studios. Andrew designed and built the vacuum formed silver backdrops that provided easy coverage for Flash Gordon's large sets. 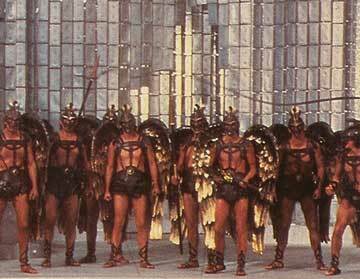 Thousands of Hawkmen characters of different sizes for filming perspective were constructed, along with spaceship models and a scorpion type monster. John Mollo was the Costume Designer on Outland and he asked Andrew to make the space helmets and back packs. As Andrew had worked successfully with John Mollo on Star Wars ANH, Andrew was given a free hand which resulted in a complex looking helmet and backpack. Andrew initially fabricated a couple of acrylic spheres together to form the basis of the helmet. The rest of the helmet then evolved by adding crowns, vents, lights and greeblies. The end result was a complete working air conditioned helmet. The helmets were so successful that Andrew used them several more times for different films - as was common practice for prop makers. They eventually ended up as the main characters in an advert for British Airways. This list is not exhaustive, but represents a selection of Andrew Ainsworth's design and build film work from 1976 to 1981.